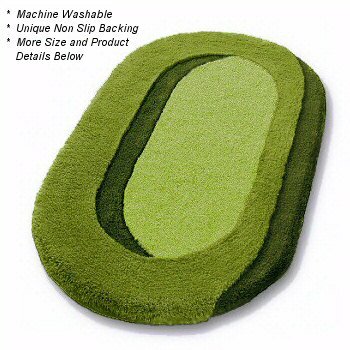 Uniquely designed oval bathroom rug with a high quality, dense, soft high pile 20mm / .79in. A large round bath rug option is also available in this design. 35.4in diameter. The sculpted pile gives this design a three dimensional effect which is quite stunning. Palm Green: Deep beautiful green tones ranging from dark earthy green to a moss green and then a palm green in the center. Coordinated Lid Cover: Solid Palm Green - matching the center of the rug. Peach: Stunning design and color theme. Colors ranging from a very light orange peach in the center to deep orange and then a burnt orange. The pile height changes and the bold colors give this rug a three dimensional look. Coordinated Lid Cover: Solid Peach - matching the center of the rug. Magnolia Rose: If you love pink you will love this rug. A uniquely designed rug with a range of pink tones from a very light soft pink in the center to slightly darker tones. The overall look is very subtle and just beautiful. Coordinated Lid Cover: Solid Magnolia Rose - matching the center of the rug. Sand Beige: Soft brown tone beige as the color palette for this three dimensional rug design. Coordinated Lid Cover: Solid Sand Beige - matching the center of the rug. Elongated lid covers for the Romance design are solid colors and are coordinated as stated above in the color descriptions.